New Reformatted Edition Dr. Bakhru’s titles have sold 1.25 Lakh copies in India! 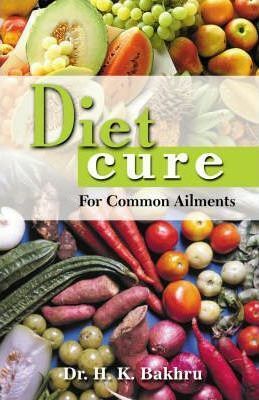 DIET CURE FOR COMMON AILMENTS covers the whole gamut of ailments which can be cured by proper food habits and regulation of one’s life, without recourse to medicinal treatment. The book is based on the theories and fundamentals of nature cure that go to preserve health and vitality and regain these when lost. It will undoubtedly be a boon not only to laymen but also to nature cure practitioners as a reference guide because of its practical utility. Nature cure has carved a niche in the realm of curative sciences in our country and abroad, though the protagonists of the drugless healing system have included many other unorthodox treatments in their curative disciplines. Nature cure, through its correct application brings about amazing changes that baffle the practitioners of modern medicine, devoid as it is of the crippling side-effects of drug treatment. The all-pervading truth is that nature alone possesses the power of healing. There are not many institutions which cater to this system. Hence, many patients cannot take advantage of it. Dr. Bakhru’s book in this revised edition with complete treatment charts and illustrations will serve as a useful guide to those who wish to treat themselves through this system at home.